The CEO of the developer of Trump Tower Moscow was behind a mysterious New York real estate transaction in late 2015, just as the Trump Organization was negotiating to build in Moscow with the developer. The property and its sale shrouded in secrecy, was first written about in 2018 by independent journalist Wendy Siegelman. At the time, it was unclear who actually purchased the property for $35 million in 2014, but now it can be reported that the man behind the purchase was in fact Andrey Rozov, per his own admission. Rozov sold the property in 2015, in the midst of the negotiations for Trump Tower Moscow for a whopping $43.5 million, a profit of over $8 million. The buyer of the property was three LLCs controlled by Dalan Management, a Property management company in New York City. It appears as though Dalan Management’s purchase of the property was a legitimate transaction, though it is unclear why Rozov sold the building so quickly. Felix Sater, the Trump associate who also helped negotiate Trump Tower Moscow, and Ilya Bykov, a tax accountant for Aras Agalarov, represented Rozov in the sale and purchase of the office building, respectively. The sale of the office building in late 2015 represents the first known monetary transaction involving Rozov and at least one Trump associate, Felix Sater. Rozov, as previously mentioned, turned a profit of over $8M in just 9 months. It was during this period that Rozov and Sater were negotiating Trump Tower Moscow with the Trump Organization and IC Expert. It is unclear if Sater, who represented Rozov in the December 2015 sale, received any financial compensation. 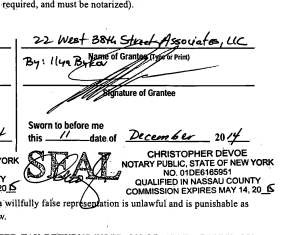 A lawyer for Felix Sater did not immediately return a request for comment. In May 2016, Bykov set up a Delaware shell company called Silver Valley Consulting on behalf of Aras Agalarov, as previously reported by this reporter and Jon Swaine of the Guardian. The creation of the company came as Agalarov shifted tens of millions of dollars into the United States from off-shore accounts. Bykov has given multiple reasons for the company’s creation, but most have made little to no sense. The intersection of Rozov, Sater, Bykov, Agalarov and the shell company that purchased 22 West 38th Street, resulting in an $8M profit for Rozov in the midst of negotiating Trump Tower Moscow will surely pique the interest of congressional and federal authorities.